A timely work that blames Europe’s current immigration disaster on the Europeans’ misplaced guilt and fatally good intentions. With the massive influx of refugees from the world’s war-torn zones deluging migration points and asylum centers across Europe, Spectator associate editor Murray (Bloody Sunday: Truths, Lies and the Saville Inquiry, 2012, etc.) takes a stance that few dare to take, as it is firmly not politically correct. Indeed, using examples from places he has visited—Lampedusa, Italy, a ferrying point from North Africa; Lesbos, Greece; Berlin; London; and elsewhere—the author surveys the movements of asylum seekers during the last few years especially and the inadequate accommodations for them. He claims, perhaps rightly, that most of the immigrants are Muslim, most are young men with little to sustain them, most are seeking economic betterment rather than asylum from life-threatening causes, and most will disappear through the legal cracks because of the inability of the host countries to process the overwhelming numbers. 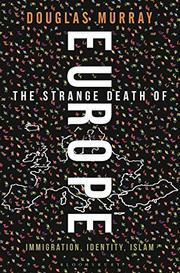 The result, Murray warns by citing dire demographic numbers, is essentially a dilution of European culture—that is, white Greco-Judeo-Christian culture, which believes in liberalism, secularism, and human rights, including equal rights for women. Instead, the author writes, Europeans, denying their best instincts and led by Germany’s Angela Merkel, are hogtied by “the tyranny of guilt,” in the form of the consequences of World War II, the legacy of colonialism, and the enslavement of indigenous peoples. While the good leaders of Britain, Germany, and other countries claim that their nations need immigration for economic growth and to bolster an aging population, Murray sees “obvious” crises such as housing and school shortages and rapidly increasing health care costs to these welfare states. He also sees “parallel communities” developing everywhere, crucibles of radicalism and crime that the mainstream dares not report due to the fear of political backlash. With violence erupting in Europe and America’s new anti-immigration policies, this audacious work will find its readers.